The first concert of the tour was one of the most important and perhaps one of the most successful. In many ways the Sunday afternoon concert in the Auckland Town Hall on June 18 set the artistic standard as well as the mood and spirit of the students for the entire journey. As the Wind Orchestra entered the hall for its sound check, many members reached for their cameras and began taking photos of the large pipe organ and the old fashioned design of the hall. One could feel the excitement when they began playing and heard the resonance that the hall provided. The Northshore Youth Symphonic Band and the Glenfield College Band combined to open the program, which was followed by an excellent performance by the Auckland Wind Orchestra. The Cal Poly Wind Orchestra performed the second half of the concert and combined with select members of the local ensembles for the finale. The group surprised themselves with how well they performed and theresponse from the audience was tremendous. The concert was billed as a "Symphony of Winds" and was a part of an on going Sunday afternoon series of concerts sponsored by the Town Hall. The event was free and the hall was almost full. A special tribute was made in the memory of Larry Voss during the concert. For the past ten years, I have spent a great deal of time adjudicating, doing workshops, rehearsals and even performances with New Zealand groups such as the Auckland Wind Orchestra, the Glenfield College Band and the Northshore Symphonic Band. I have long dreamed of having these people hear a live performance of a mature American university wind band. For many, I believe it was a life changing experience. The next performance took place the following evening, June 19 at the Michael Fowler Center (MFC) in the city of Wellington. The MFC is considered to be the finest concert hall in the country. It is the home of the New Zealand Symphony and is extensively used for recording. The design of the hall is similar to the Sydney Opera House seating almost 2,000 people. A great deal of time and effort went in to the scheduling of this hall for the Cal Poly Wind Orchestra. After intense negotiations, the MFC agreed to provide the venue, staff, and promotions if we would provide our own transportation, meals and housing. About two weeks prior to our arrival, the management called and recommended that the concert be canceled due to the lack of advanced ticket sales. (Monday evening in the middle of the winter was seen as the problem.) Fortunately I managed to talk them out of such a decision and recommended that they use radio and television for last minute promotion. I even went on live radio for almost 30 minutes one evening prior to our departure and was on live television just four hours prior to the concert. We were the only group to perform and we decided to put on a full-scale concert with our best literature. By concert time over 1,000 people were in the hall. The group performed extremely well although not as well as the previous afternoon in Auckland. The MFC organizers were thrilled. Many of the United States Embassy personnel were in attendance as well as most of the Central Band of the Royal Air Force. Two days later, June 21, we performed a concert in the Municipal Theatre in the city of Napier. Napier, located on the East Coast, hosted the 1999 national concert band festival, which I adjudicated. The host band for this festival was the Hawkes Bay Symphonic Band who performed the first part of the evening concert. It was not easy to perform in an acoustically dead theater after becoming so accustomed to world-class concert halls. The group did very well, however. The final New Zealand Concert took place in the Founders Theater in Hamilton just one and a half-hours south of Auckland on Friday, June 23. I conducted a concert in this venue with the New Zealand National Youth Concert Band in 1991. This concert was shared with the very fine Waikato Youth Symphonic Band. Because it was our final New Zealand Concert, and because the students were in such high spirits from the previous free day in Rotorua, the performance was outstanding. It was basically a dress rehearsal for the Opera House. Our first performance as a part of the International Music Festival took place in the Sydney Opera House on Sunday evening, June 25. The Festival Opening Gala Concert featured a youth choir from Western Australia, a community choir from Seattle, Washington, a youth concert band from Singapore, a youth concert band from Perth, Australia and the Cal Poly Wind Orchestra. This was one of the big moments for Cal Poly and we were thrilled to have the opportunity to close the concert. The beauty and power of the Cal Poly Wind Orchestra in that hall on that evening will long be remembered. The group was almost technically flawless and they reached for a level of expression that had not been experienced before. The large audience was overwhelmed with the quality of the performance and for the next week we received many compliments from the many festival participants who were in attendance. We performed Jan Van Der Roost's "Olympica", David Rackley's "Third Stream Bridge" featuring Paul Rinzler and Stephen Melillo's "Speech of Angels" and "Godspeed". On Tuesday, June 27, we performed an outdoor concert in the band shell at Darling Harbor. None of us were really looking forward to this event. As we began playing, however, a very large crowd formed and we managed to really get into the concert. We had chosen some good outdoor music such as the John Williams Olympic theme from the 1984 Los Angeles Olympics, "Mars" from the Planets by Holst and Tchaikovsky's "Overture 1812". We closed with Sousa's "Stars and Stripes Forever" conducted by David Rackley. We were now ready for the most important concert of the tour, the Sydney Town Hall on Thursday, June 29. The main work for this evening was a performance of the "African Sanctus" by David Fanshawe. All of the festival choirs joined together for this major work for large choir, soprano, tape recordings of African music and a small orchestra of percussion, keyboard and string i nstruments, conducted by Geoffrey Boers, Director of Choral Music at the University of Washington. The concert was widely advertised throughout the city and the Town Hall was filled to capacity. The concert began with a short organ recital and the Cal Poly Wind Orchestra took the stage to round out the first half of the concert. We knew that this would be our finest opportunity to make a strong musical statement at the festival. We chose to perform James Barnes' "Symphony No. 3" written just after the death of his daughter Natalie. After giving a brief description of the work to the audience, the orchestra performed the 40-minute symphony with a level of sensitivity and artistry that I had not ever experience with any Cal Poly ensemble. The group and I were almost in tears by the end and the stunned audience was deeply moved. It was Cal Poly's finest moment, and it will be forever remembered. 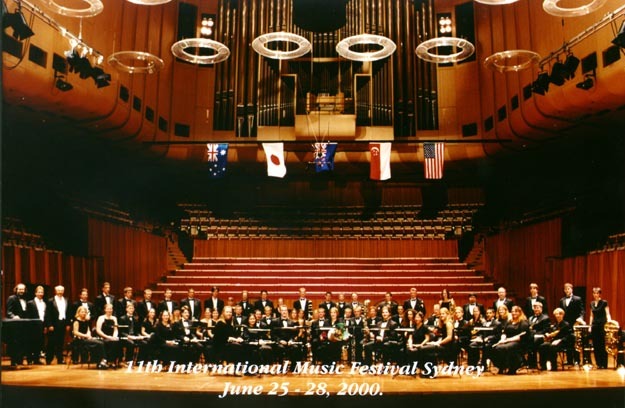 The "World Wind Band" (WWB) was formed at the beginning of the festival and had daily rehearsals until its concert on Friday, June 29 in the newly constructed Angel Recital Hall in Sydney. The 85-member ensemble consisted of the principal players from all of the wind ensembles participating in the festival. Mr. Tian Tee, Lee from Singapore and myself, conducted the group. At first, there was some degree of discouragement due to sight-reading new music. By the concert, however, the group had become a strong musical organization and performed very well. The international nature of the ensemble made the experience very meaningful. Throughout the tour, the orchestra traveled on two busses with tour operators from Contiki. Upon our arrival in Auckland, the "City of Sails", we went on a five-hour coach-tour of the city visiting Mt. Eden, the very large War Memorial Museum, Harbor Bridge, Northshore, the new Auckland Tower and the downtown district. No one went to sleep until the evening and, upon awaking the next morning, we were adjusted to the new time zone. After the concert in Auckland we flew to Wellington. We had a free day to ourselves after the Wellington concert to enjoy one of the country's most beautiful cites. The TePapa museum and the botanical gardens were spectacular. It took over five hours to travel to Napier the next day, but the scenery was spectacular. We had just enough free time in Napier, the Art Deco city. After our Napier concert we had a free day to enjoy the tourist sights of lake Tapu and Rotorua. Our sightseeing included the Whakarewarewa Thermal Reserve and the Maori Arts and Crafts Institute. That evening we attended a very interesting Maori "Hangi" feast and cultural concert at a Maori "reservation". It was both entertaining and educational. The students seemed to enjoy themselves very much. Much to my dismay (I worked hard not to object), many of the students went Bungee jumping the next morning. Amazingly everyone returned. We then went to a show of sheep dogs and sheep that fascinated everyone. The group returned to Auckland for more sightseeing and then flew to Sydney, arriving late Saturday evening. Throughout the week in Sydney there was much sightseeing between rehearsals and concerts. On one afternoon we left the city via the newly constructed Olympic facilities and traveled to the Blue Mountains. On the way back we visited a very large wildlife park were the students held koala bears, played with kangaroos and saw large fruit bats and an 18' crocodile. On our last day we went on a harbor cruise and afterwards gathered around in a circle and expressed to each other our feelings and thoughts about what we had just experienced. In conclusion I want to thank everyone who worked so hard to make this extraordinary experience possible. The generous donations from a large number of people, the enormous support from the Instructionally Related Activities Fund provided the basic funds for the journey. In addition, the support from Dean Hellenbrand of the College of Liberal Arts and Clif Swanson of the Music Department in the last hours before departure gave 61 Cal Poly students an educational, artistic and cultural experience that will long be remembered. We also want to thank Sue Childers-Kraft for the special effort she and her staff made in our behalf. And we want to thank the Music Department staff, Druci Reese, Michele Abba and Ben Reveley for all of the extra work involved in this most complicated enterprise. I want to thank David Rackely, his wife Cordelia, my wife Pamela and Paul Rinzler. They all worked very hard to make the tour run smoothly. In addition we had several parents of students who traveled with us who were extremely helpful. David composed a piece for wind orchestra and jazz piano especially for the tour and Paul Rinzler was the soloist. This work provided a great deal of variety to our repertoire and it received many positive comments from our audiences. Finally I want to commend our student leaders, Mark Searby and Adraian Angle and their staff for their extraordinary leadership. The level of discipline was very high and everyone adhered to the written policies and behaved in a professional manner throughout the tour.